Protect Texas’ Wetlands: Save the Clean Water Act! In Texas, we depend on water. Across the state, we live with a complex network of waters that connects our communities – ranging from our 80,000 miles of bayous, rivers and streams to our countless acres of wetlands. Currently, the Trump administration is proposing to remove whole categories of waterways of their Clean Water Act protections. Across the country, wetlands, tributaries, and streams that aren’t connected directly to waters classified as “traditionally navigable” would be stripped of their protected status. In the Upper Texas Coast, our coastal prairie wetlands are most at risk – a critical line of defense against flooding and pollution. Tell the EPA to Save the Clean Water Act! 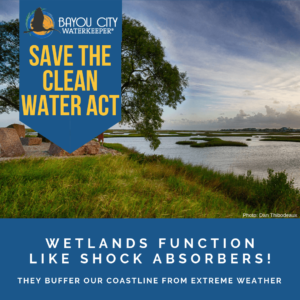 Our coastal prairie wetlands play a vital role in our safety – including improving flood control and water quality for our families and the fish, shrimp and oysters in our bays – the standards set forth in this rule would remove protections for more than half of the wetlands in the nation. The proposed revisions for the “Waters of the United States” rule is currently out for public comment. This is the opportunity to let the EPA know that we expect them uphold their mission and protect human health and environment – not give polluters a free pass. The EPA should be providing maximum clean water protections to all communities. Tell the EPA to save our Clean Water Act protections and maintain our historically protected waterways for generations to come. This is your opportunity to make your voice heard.